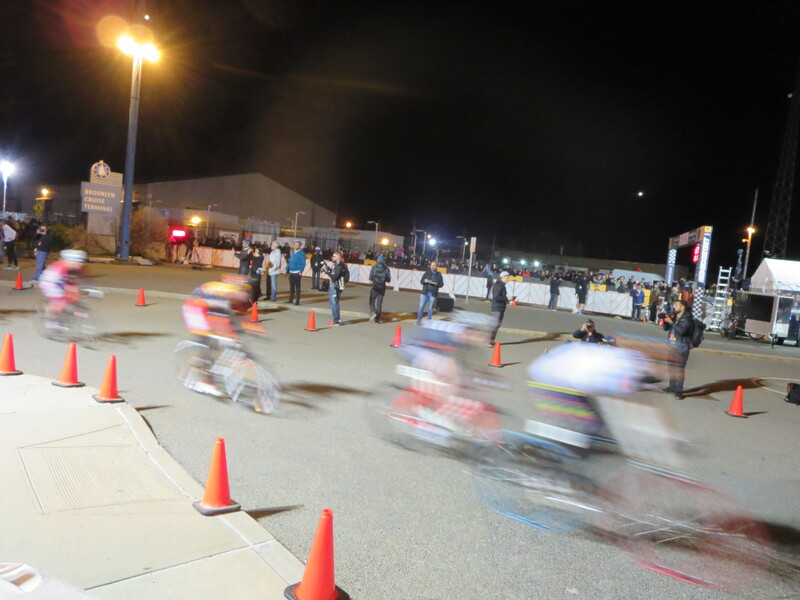 Women racers heading for the second hairpin turn. So guys, how about we all get single speed bikes with no brakes and ride them in a loop with two hairpin turns twenty-four times in a row? Oh wait, someone already came up with that idea: it’s called Red Hook Crit(erium). On a Saturday night in April I biked over to the Brooklyn Cruise Terminal at 8pm. I wasn’t gonna miss this: I had been hearing about it for weeks: Red Hook Crit is one of the most reputed, and dangerous, bike races in New York. Anyone can enter the qualifying rounds, so you end up with a combination of pro-racers and newbies. This is part of what makes it dangerous–you have a combination of racers who know what they’re doing and racers who don’t. The bikes are special (they’re called track bikes). Brakes are not allowed. Everyone rides single speed. The pedal cranks are shorter so cyclists can take deeper turns (but as the race would go on to prove, the cranks still aren’t short enough). This is the other part that makes it dangerous. I got to the course just moments before the start. And of course, most attendees were also bike-riders. 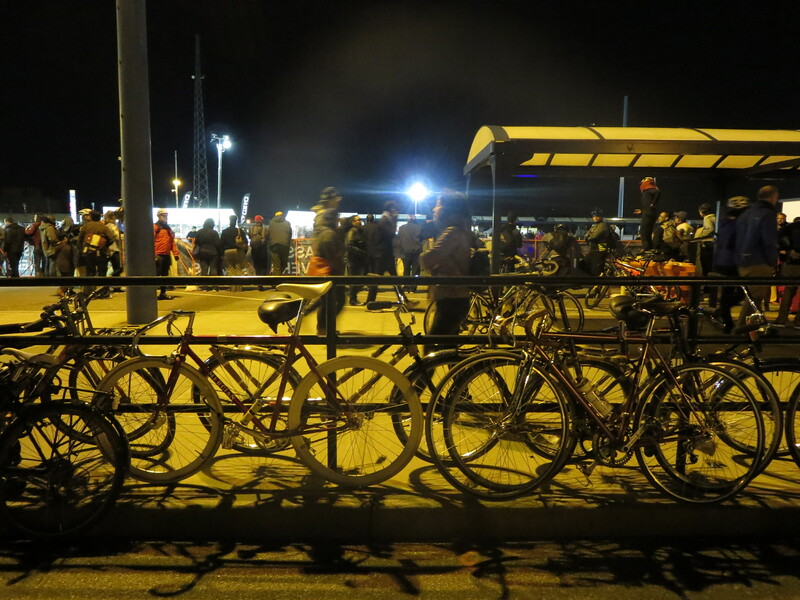 There were bikes locked upon bikes. Bikes locked to anything you can lock a bike to. I was in good company. The racers collected at the starting line and a buzzer started them off. The first few laps went smoothly… but on about the fifth lap, coming around the curve opposite the start, a cyclist went down. It happened so fast I couldn’t even see why it was that he fell. Another cyclist tripped over him and a third swerved wide and yelled at anyone who would listen. The cyclist who went down first was out of the race. The other got back on his bike and hustled to catch up. You’ve got to hustle–if someone laps you, you’re out. It’s a race with high stakes and low payout. If you win, great, but no one will know your name. And your chances of being part of a bike pile-up are high. So why race? No one could tell me for sure. For the thrill, for bikes, for street cred… Whatever it is, it brings more than enough people to the starting line.